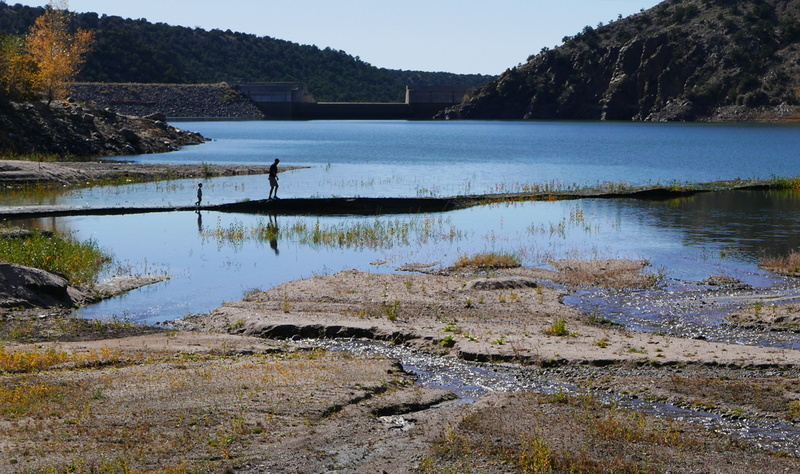 Will it be El Nino? Will this one be better for us than the last one? Maybe just wishful thinking but it feels like it. 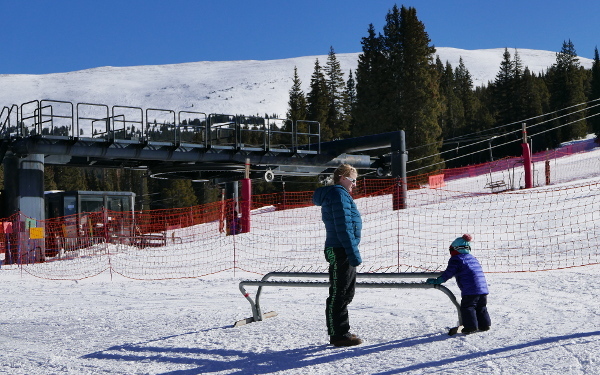 Playing at the ski basin on a nice fall day. Nice shot, Iggy. 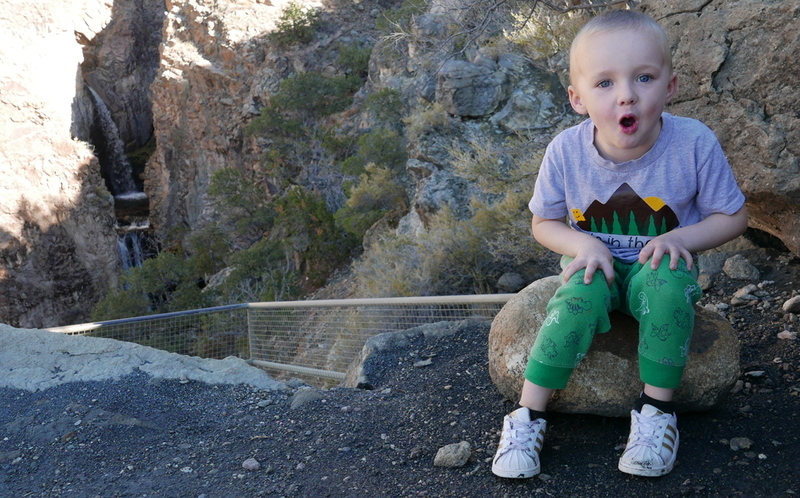 I'm proud of this little ham for hiking to the Nambe Falls overlook. 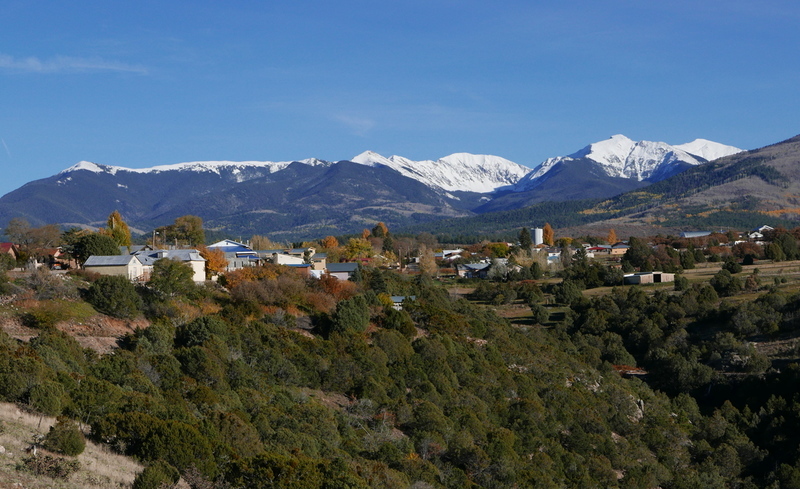 The view at Truchas looking mighty nice. I see Iggy shares your taste in sun glasses. At first we thought he was just a little beast but that kid has an indomitable sense of style and god help you if you try to impede him. 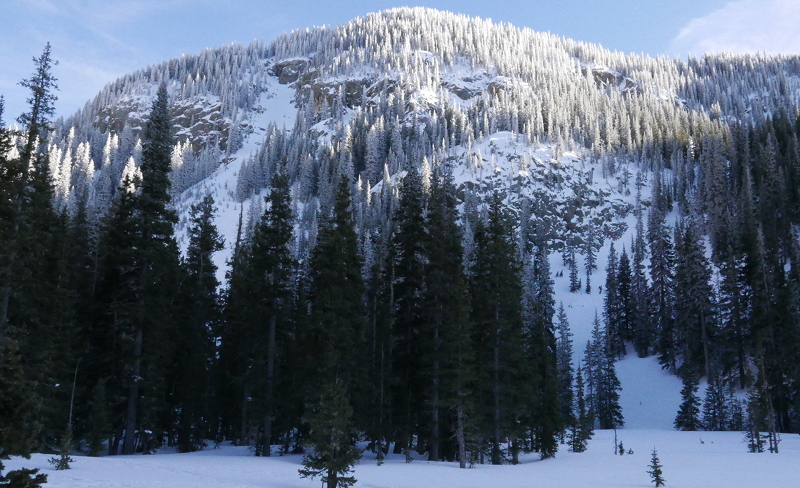 Ten inches new at Ski Santa Fe this morning! hahaha, my reaction when i first saw that pic was that Iggy has a particular sense of style that rang familiar...he's only missing some bright fireman-red leggings or visor or similar accouterments. nice shots geezer. stoke is palpable. the early-season snowy caps always raises the pulse. The stoke has given rise to quite the conflagration in these parts. My parents were kind enough to watch the boys so Alisson and I took a trip this weekend. 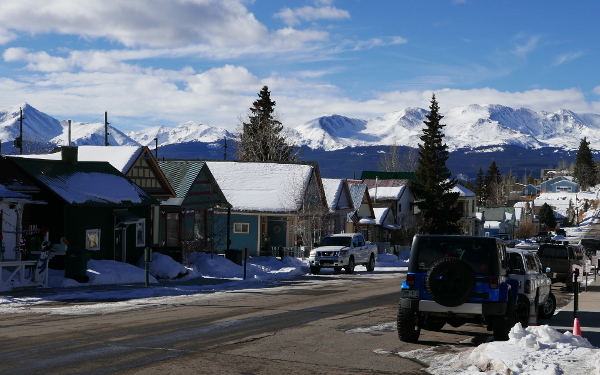 Drove up to Leadville Saturday afternoon/evening, which is a pretty reasonable drive. 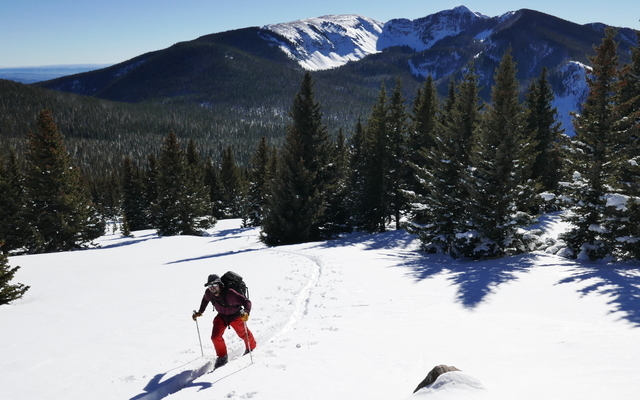 Sunday morning we made a loop from Leadville toward Minturn and Vail, taking the long route to Arapahoe Basin. 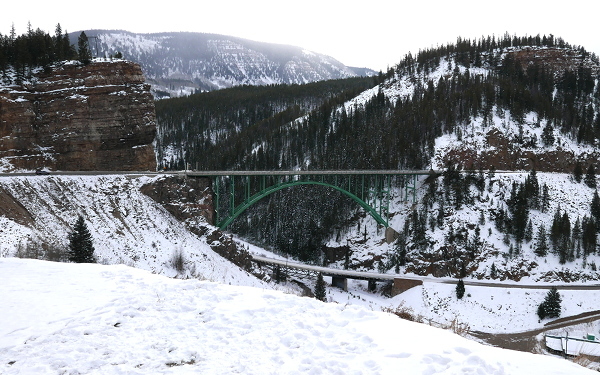 Red Cliff is just kind of a neat spot. Alisson is still trying to get the fit right on her boots and adjusting to the Dynafits. 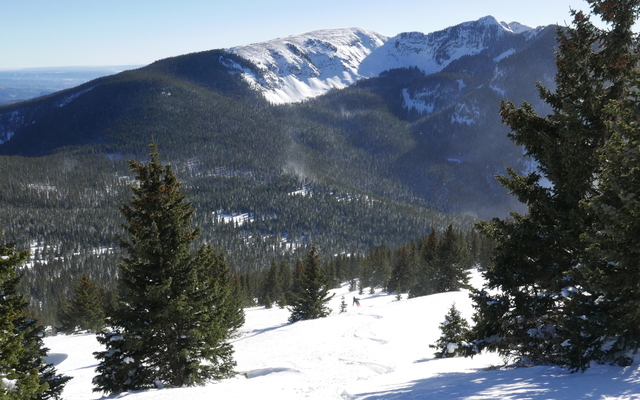 Here she makes a lazy turn approaching all of our front range friends at the bottom of A Basin. 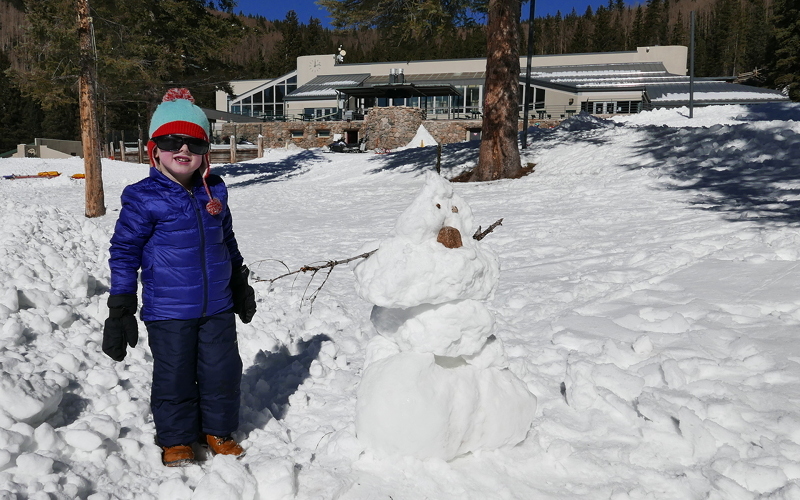 A slight adjustment on the boots put her in a good enough place to hit the upper mountain where we found some nice snow. The drive home was pretty rough. 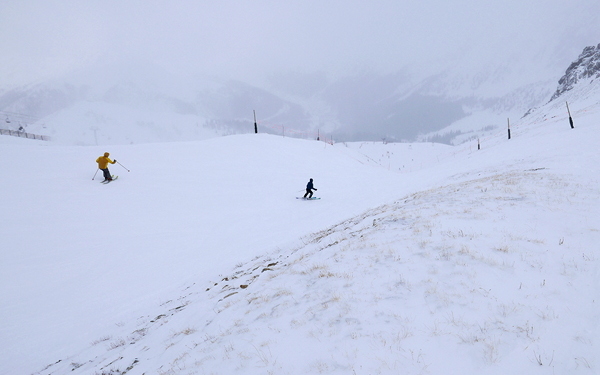 Some very low visibility for prolonged periods when it was snowing and blowing. We took a nice break to relax at Joyful Journey Hot Springs. All said and done, Ski Santa Fe got 15 inches from this storm! And they already had a fair bit of snow up there. Game ON in New Mexico. 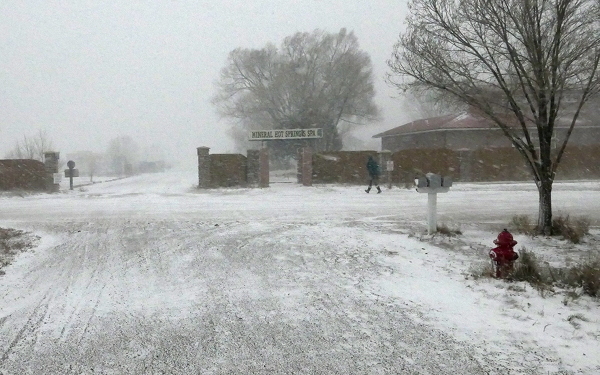 Senora Diana at Kaj's school told us it snowed a foot in Truchas where she lives -- location of last photo in initial post. Yeah yeah yeah. Well we got up to the ski hill with the boys this morning. It looks ready for opening day this coming Thursday. We put the boys on the toy plastic skis. 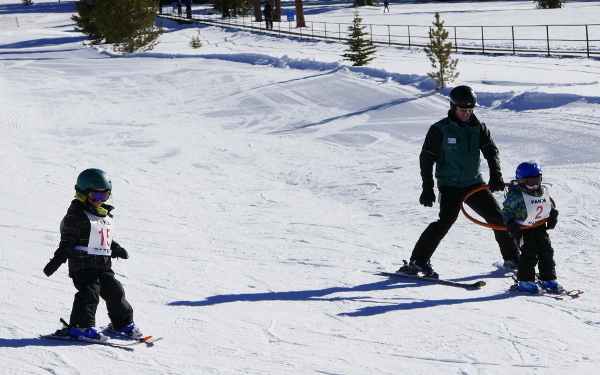 Egil enjoys the glide with a mommy assist. Kaj: "Do you want to build a snowman?" Custom Title: are we there yet? How's life in the water hemisphere? There's a whole nother 70% of a cool as planet down here b's Can't even hear the bleats of the gigaflock or their grand wizards @ ≥5 metres b.s.l. Looks like snow in the forecast for next week. Hope it holds! We got a good start but it's been mostly bone dry for a few weeks now. 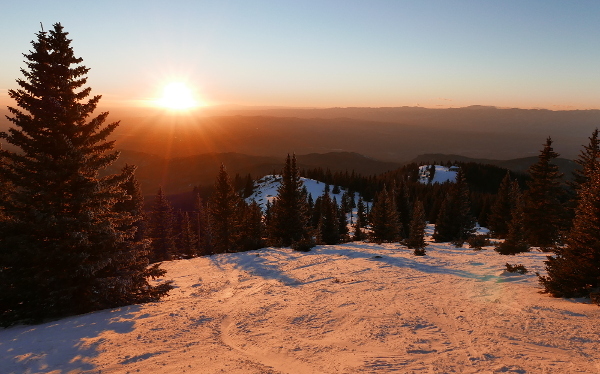 Ski Santa Fe area was open on black Friday with decent snow. Last weekend we hit Leadville again. The views of Mt Elbert and Mt Massive from downtown are decent. Skied an afternoon at Vail and liked it, crazy. 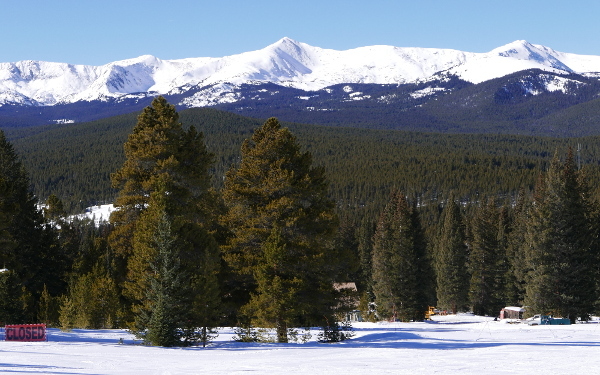 Then we headed to Ski Cooper, a small ski hill near Leadville. The views are nice. Iggy is still too young for a lesson. 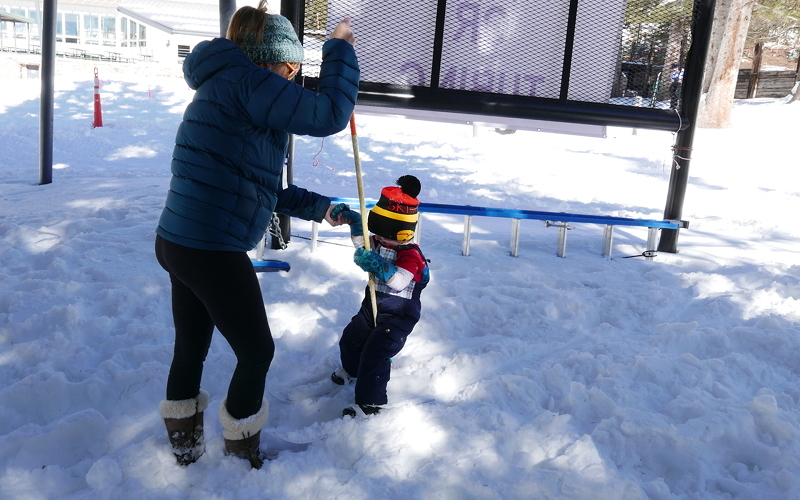 Kaj and Kuba got their first ski lessons. Kuba was a natural at making pizza right off the bat. Eventually they both rode the magic carpet multiple times. 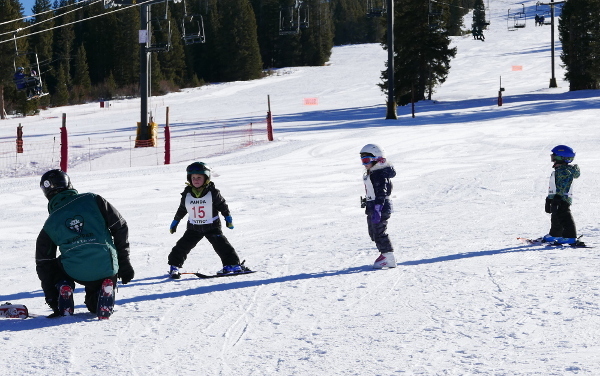 Kuba was skiing 100% independently. Here Kaj gets the hoop assist. The ski school people there are very nice, thanks Ski Cooper! 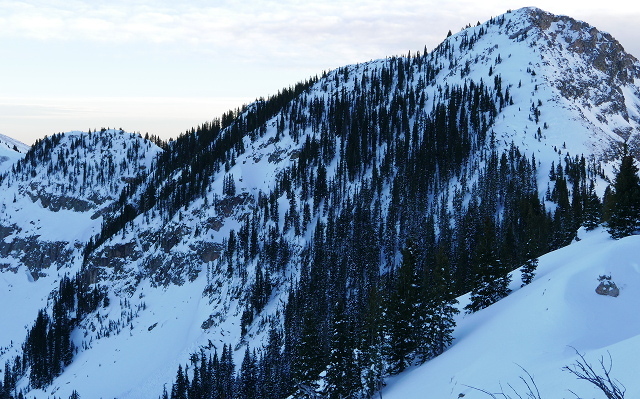 Skied on the south side of Santa Fe Baldy with Aaron yesterday. Estimated vertical is about 4,000 ft and I got moderately worked. 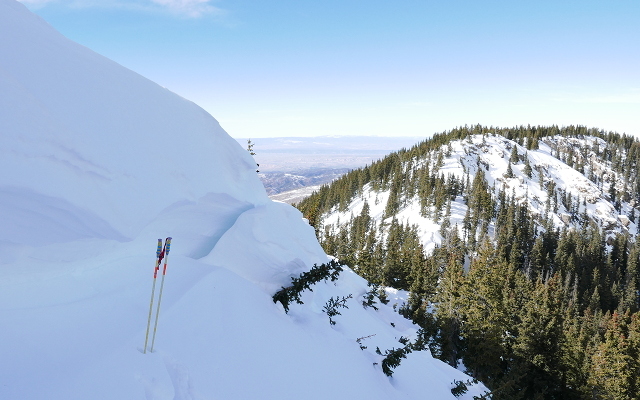 Breaking trail was arduous on Baldy! It doesn't look too bad here but each fresh step was approximately triple effort and my hypo-aerobic lifestyle was giving me a taste of tachycardia. Around tree line the time of day, wind, and evolution from decent snow to slabs cued our descent. 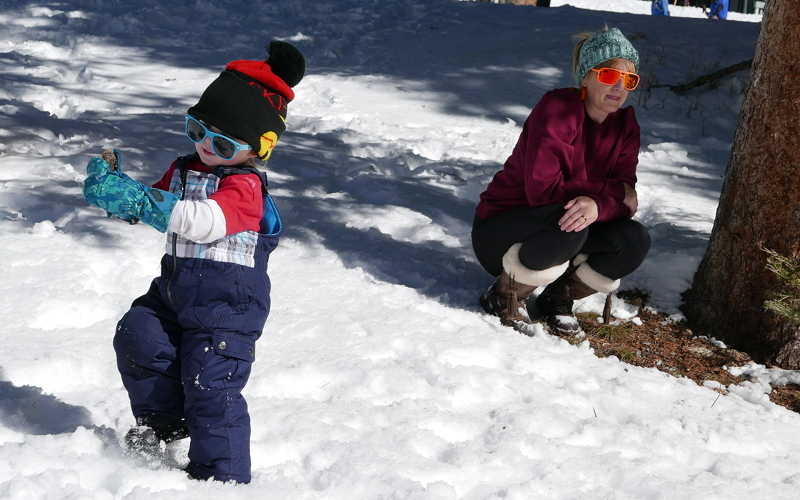 We found enough good snow that the day is not classified as strictly exercise. 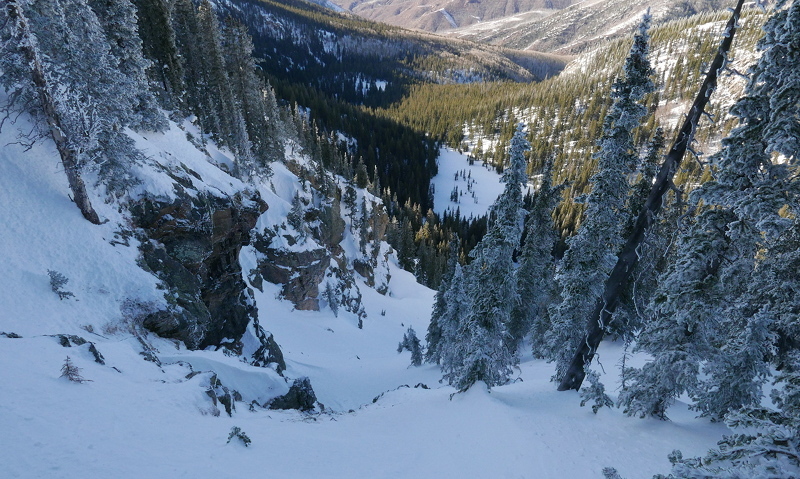 Our final descent to the parking lot was the surprise bonus of the day with very nice conditions. AWESOME!!! what did your time from car to car look like for Baldy?? 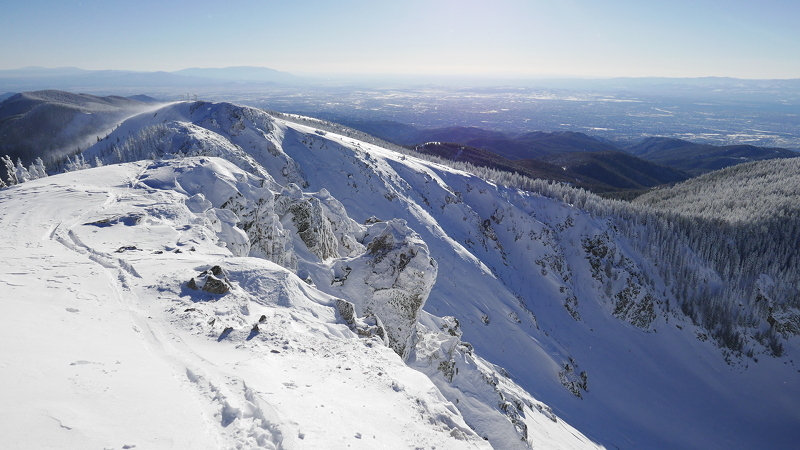 We didn't go to the summit, only about 12k, due to wind and slabs and time of day. Round trip was right around six hours, with one descent on the way out to Baldy and another good final run to the parking lot. 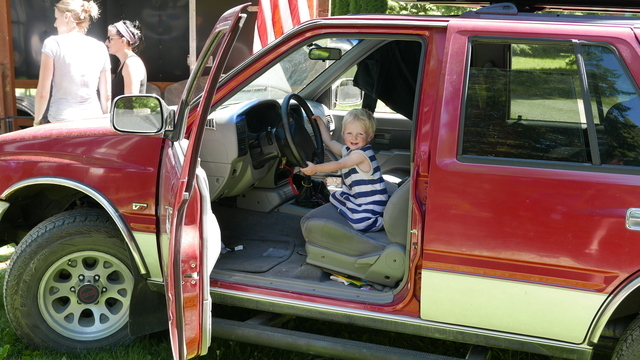 The vehicle that has repeatedly won our hearts over the years is having difficulty. Without its services I didn't feel like driving our Nissan Sentra up to the ski hill yesterday. They got 17" between Thursday night and yesterday and the roads were snow covered. Instead took the bus up there. The $5 fare comes with a $5 Ski Santa Fe discount. 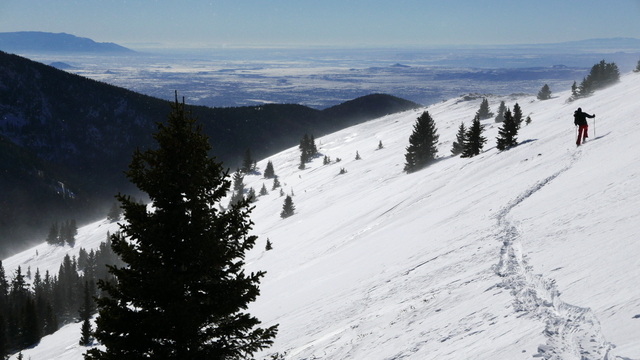 A 1:05 pm bus departure from downtown Santa Fe, at the base of the ski hill just before 2 pm. Bought a two-ride lift ticket for $(25-5)=20 and made my way to the summit of Lake Peak as quickly as conditions and my fitness allowed. 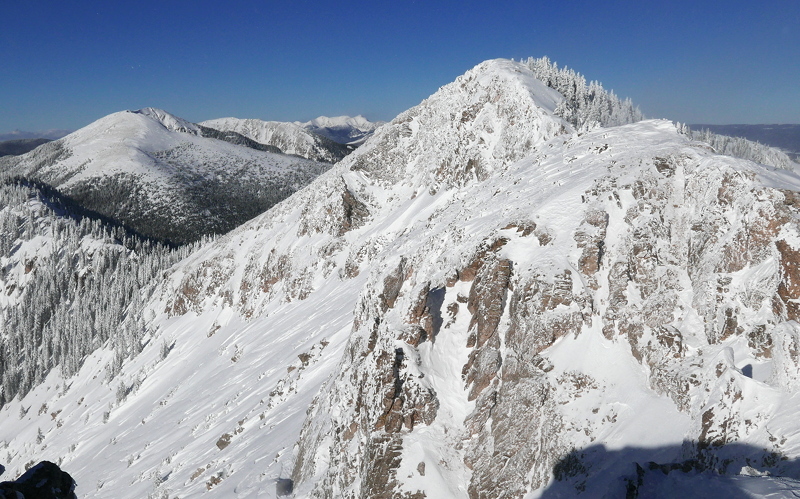 Summit of Lake Peak in the background. Cursing through a few spots where it was a wallow through snow up to my waist, I was on the 12,409 ft summit a little after 3 pm. 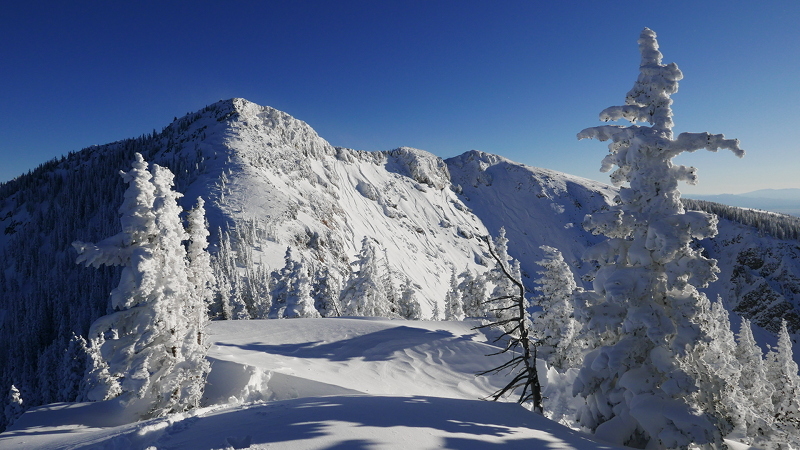 It seemed advisable to use caution on the upper portions of the ski down the ridge to the north toward Heaven's Hill. Made a few small ski cuts but nothing really moved. 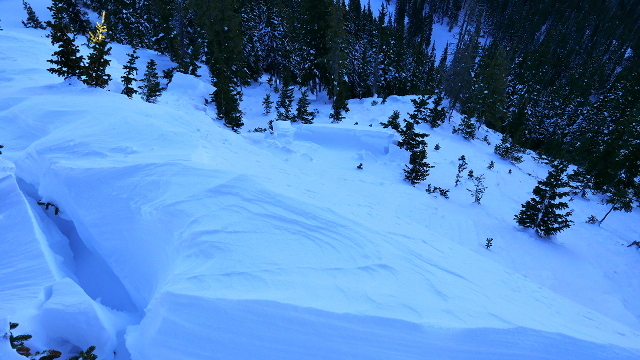 Some very nice powder turns on the lower portion. Worried about catching the 5 pm bus home, I skinned toward the top of Heaven's Hill as quickly as possible. 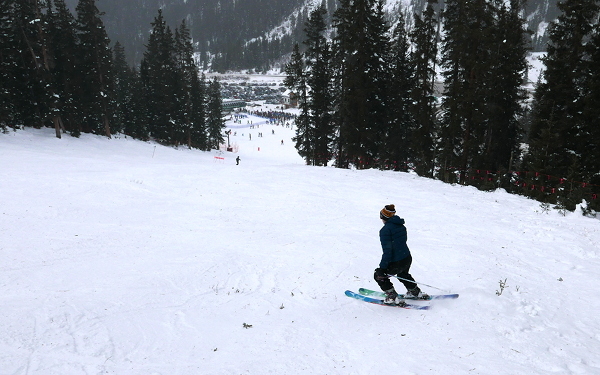 Started down a very enjoyable powder run at about a quarter to 4 pm. Made the transition on the Winsor Trail as quickly as possible, started skinning just before 4 pm, still worried about catching that bus. 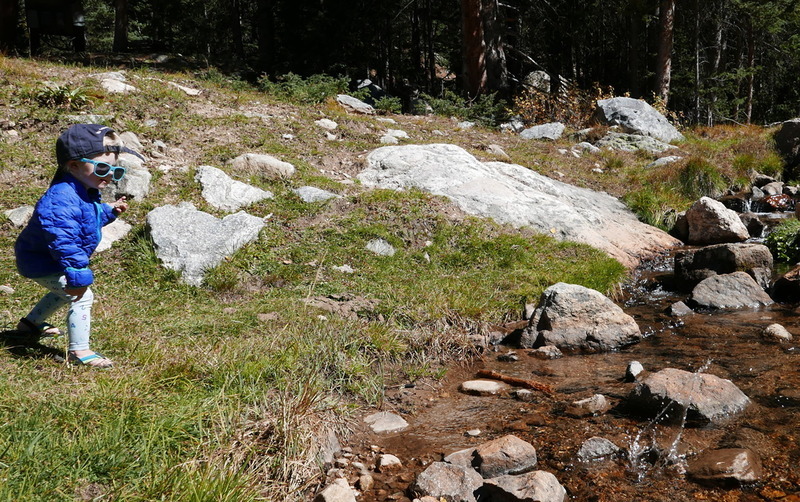 To my pleasant surprise, I was able to cruise the 2.3 miles rising from about 10,400 ft to 10,800 ft in half an hour. Maybe I'm not as over the hill as I feel some days. Skied half trail and half powder to the upper ski area parking lot and caught the bus with nearly 20 minutes to spare. The eBikes and eSkates are taking over the town here. Seen fooz drifting street corners on eScoots @40kph in Auckland over NYE. Perhaps a quiet stealthy eSnoMo MiniLite, exempt from ranger detection, for the Murcan market? That seems like a concept with a lot of traction. There were threads on TAY about snowbikes in the last few years. 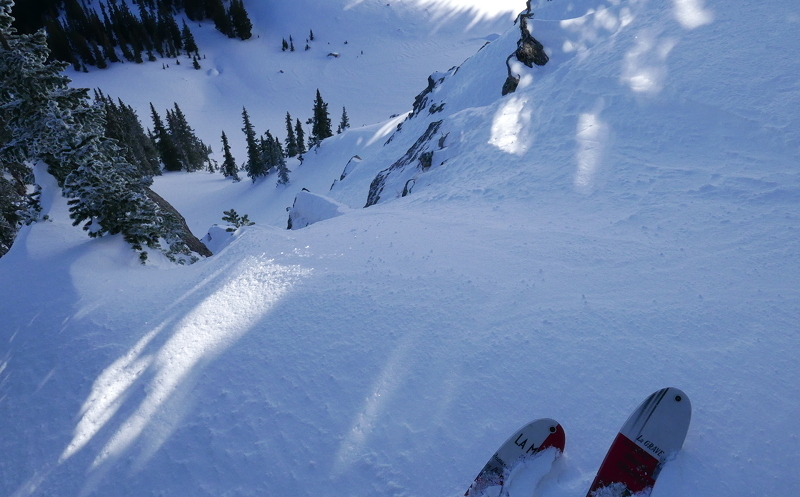 But from where I sit, ski tours are some of the only times I escape eLife and that disconnect seems like a good thing. Noticed a natural slide in my zone while doing a solo tour this afternoon/evening. Crown estimated at 2 ft high. It didn't seem like a good idea to get closer for a better estimate. Looking down from the same spot as the previous shot. Slide in first pic starts halfway down ridge coming from peak, at the small trees below the ridge. Lots of debris at the bottom left. 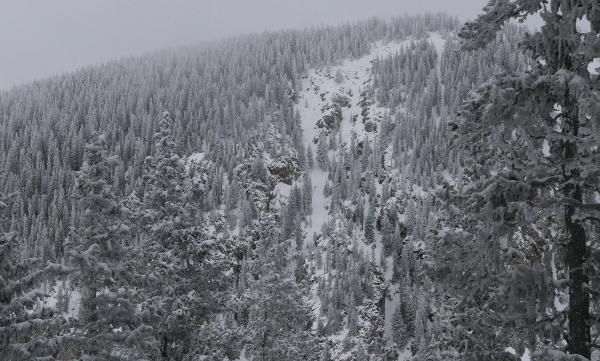 The slide might have ran 200 ft along the ridge to a lower saddle. There was a crown about that far away, not totally sure it was connected. We got a big dump and it was a beautiful day. 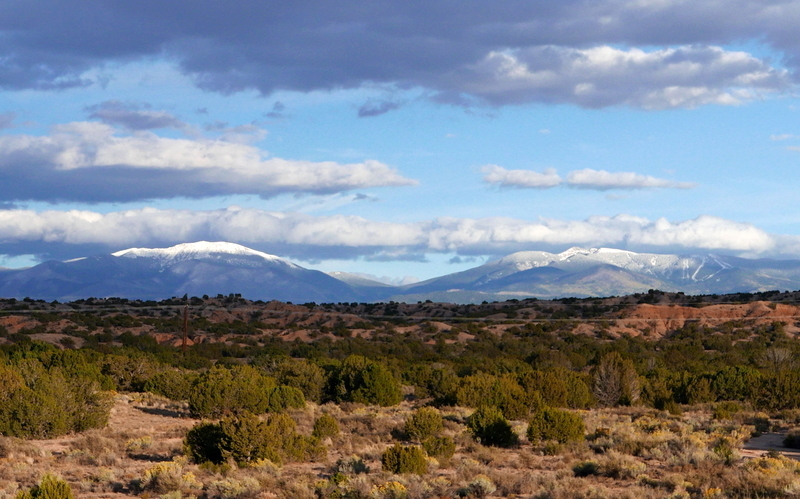 Looking back toward the ski area and Santa Fe. Looking good to the north. Lake Peak from the north on the way to the not-stash. Sky, you have got to take me with you on one of these tours. looks super awesome! Let's go. 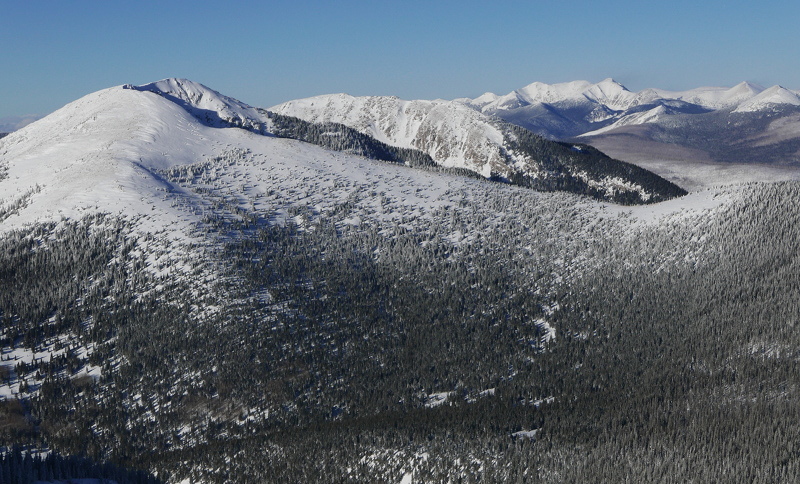 Snowpack should be coming into condition for more adventurous tour with the warmer weather this week. 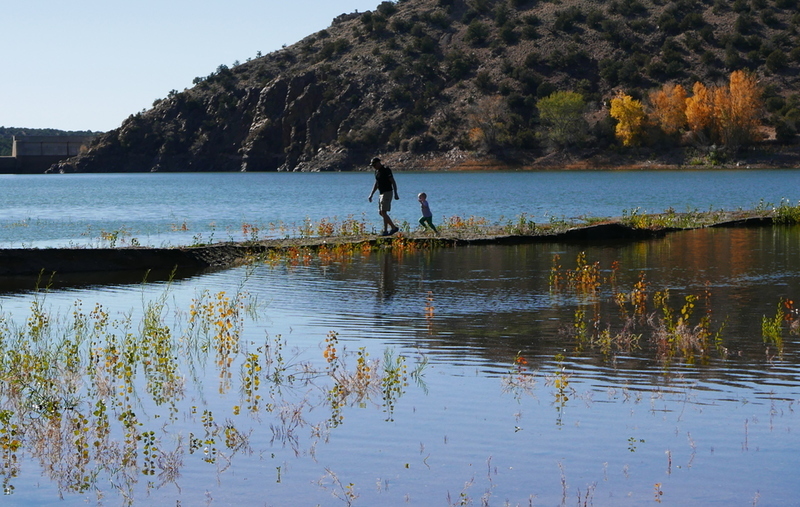 Local backcountry mini-golf gnar zone is in the best shape I've seen since moving to Santa Fe. Untracked but can't possibly be a secret? Slightly more difficult to obtain. That was very nice. 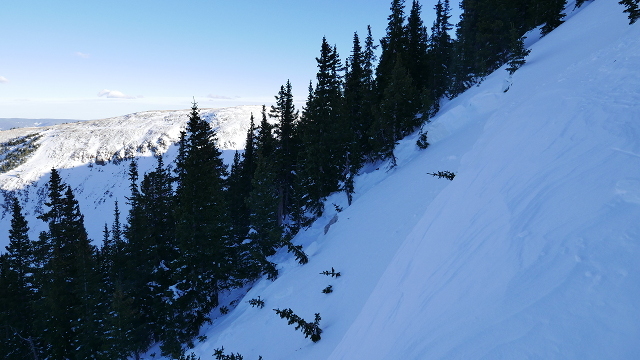 Chute proper was hard windslab but the trees above and below it were as good as it gets, old cold pow.